Log onto https://myetudes.org with your instructor account. Click on the tab of the course site that you’d like to populate with eCollege course content. Select eCollege from the options. Browse and choose the course backup file. This may take several minutes to complete, depending on the amount of data you had in your eCollege course and the speed of your network. Do NOT close the window during this process. Wait for the confirmation message that the operation was successful. Verify that your content was imported in the various tools of Etudes: Announcements, Syllabus, Modules, Assignments (equivalent to DropBox), Discussions, and Resources (equivalent to Doc Sharing). You are now ready to review your content and make the necessary adjustments to instructions that were specific to eCollege, remove dates from your content, etc. Tests and quizzes (Refer to functionality developed by Etudes to help you copy eCollege tests onto Etudes). Course Scheduler (dates, points, and settings). This is easy to set up in Etudes, however. Syllabi items other than the first composed item are not exported by eCollege. You will need to copy/paste the rest of your syllabus items. 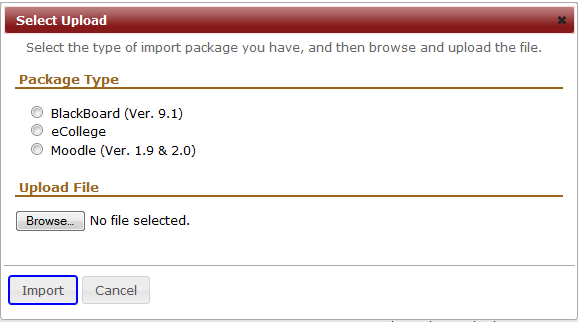 eCollege does not export point values for discussions, so Etudes assigns the default value of 1 to discussion forums. You can change the point value of the imported forums under Discussions >> Manage Forums.